Budget Savvy Diva has another fabulous recipe to share with us this week! How yummy does this look – less then $10.00 !!!! Wonderfully Filling! Prepare a 9×13 casserole dish with cooking spray. Mix milk and soup thoroughly in bottom of dish, place raw, cleaned, de-boned and de-skinned chicken breast in soup mixture, mixture should cover chicken just slightly. 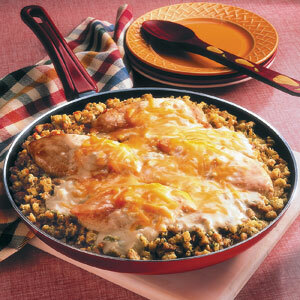 In a separate bowl mix water and butter gradually with stuffing mix, stir until moist, put stuffing on top of chicken. Goes well with any veggie you associate with Thanksgiving, Christmas, or Easter dinner, it has a way of making the house smell like the holidays. Thank you Sara aka Budget Savvy Diva for another great recipe!